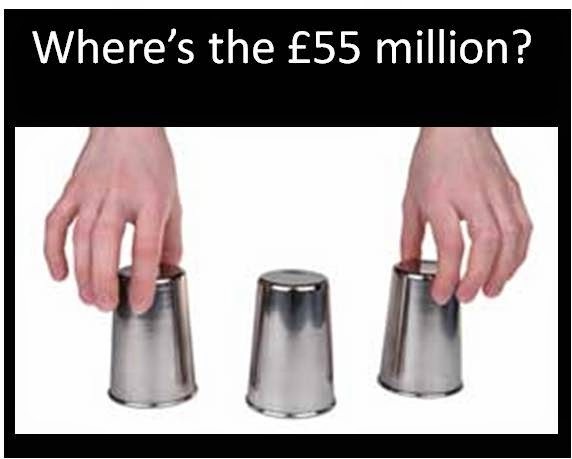 One Day Till the Voters Decide - Where has the £55 million gone? That is very much a matter of personal opinion so I'll leave that for you to decide. However, as someone who I respect a great deal said very recently "nothing catches my attention more than finding out people are spending my hard earned money unwisely and without consulting me" so I thought for my last blog before the election I would focus on the money Barnet have handed over to Capita. According to the Supplier payments system in the financial year 2013/14 Barnet paid Capita (including the Re joint venture controlled by Capita) £55.3 million. Bear in mind that the contract wasn't even signed until August and didn't commence until September/October so that represents just over 6 months where Capita have been running services. Bearing in mind that the total value of the two contracts should be no more than £36 million per annum (when all the alleged savings are taken into account), I can't understand why we have shelled out £55 million for just six months worth of contract. So how come Barnet have paid so much? Firstly, Barnet residents have paid millions of pounds to make hundreds of council staff redundant even though councillors repeatedly denied this when questioned about it before the contract was signed. Redundancies impact many people. Directly it impacts the person made redundant especially those who are older and may struggle to get another full time job. It impacts their families - if they are unable to secure a new job quickly it may mean they have to move out of the area to somewhere their housing benefit will give them even the most basic of accommodation. Their children will have to move schools and all of their friends. They will lose the support network of family and friends so vital when you have young children and/or elderly parents and we, as residents, are paying to make that happen. Then there is the unresolved matter of who funded the capital investment in IT. Barnet paid £16.1 million to Capita to fund investment in IT. The council tried to explain this away by saying this wasn't the council investing in IT it was just bringing forward some of the money it would have to pay to Capita over the next 10 years. Yet when the council rejected the possibility of investing in an in-house team it was because they had no money for investment. The council also paid Capita £14.7 million as part of a management fee for Capita to assist the council while awaiting the outcome of the Judicial Review. Cabinet members approved a contract of up to £14.7 million yet one week later the council paid Capita the entire £14.7 million in full. As it transpired the Judicial Review took place quite quickly thereafter and the actual value of work carried out by Capita during this interim period was only £700,000 leaving £14 million paid unnecessarily, in advance, which had to be clawed back against future payment. I blogged about this in October last year. So when you are standing in the voting booth tomorrow with your pencil poised to make your cross, think very carefully to yourself. Will the candidate safeguard my money carefully and responsibly or will they hand it over when asked without understanding what it is for? Will they challenge officers and ask for clear evidence? Will they scrutinise closely and make sure they are fully satisfied with why so much money is being paid out or will they just roll over and do as they are told? These are critical questions and any candidate deserving of our votes should have a very clear view on all these points. Make sure you ask them. In the run up to the elections on the Thursday I thought I would revisit so of the key issues that have cropped up over the last four years. Today I want to focus on the issue of money and in particular how Barnet have spent our money. As readers may be aware, I pay close attention to the supplier payments over £500 which the council are required to produce by law every month. Over the last four years this has been a source of very valuable data and an insight into how the council operates. Back in 2010 I raised the issue about the cost of supplying councillors with new and very expensive tablet computers which with all the add ons cost £1600 each - entirely unnecessary for the activities of 99% of councillors - but deemed easier to have the same posh tablet computers than buy cheaper ones. This is because the Council had already purchased 2450 of these tablet computers for staff to be able to work from home overlooking that fact that many of the basic desktop computers used by staff every day were out of date and inadequate for the job they were supposed to do. I also managed to ascertain that the council spent £22 million on a computer system that was originally budgeted to cost £2.5 million (the costs continued to rise after my blog post in 2011). It demonstrated how the council had started with a modest but entirely functional idea but after listening to consultants and being driven by the supplier had ended up with an incredibly complex and expensive system that actually didn't give the council a lot of the functionality is actually needed. This was a very clear early warning sign of the risk that the One Barnet project might follow exactly the same course. Over the last four years the council have spent a fortune on temporary staff and consultants and which the council have done their best to keep secret from the Bloggers. For a number of years the council have employed senior officers on longer term contracts as consultants paying them up to £1,000 a day, a strategy which in my view is both excessively profligate and leaves the council with a lack of continuity when their contracts expire. In 2013 I blogged about the excessively high salaries of people at just one meeting where I totted up their salaries of just 8 people amounted to over £1 million. Now with such highly paid talent in the council's senior management team you would not have thought there would be a need for more consultants. But that's where you would be mistaken. When Barnet embarked upon the One Barnet outsourcing programme they brought in a firm of consultants, Agilysis and iMPOWER to act as the council's "Implementation Partner". At the time I raised concerns about how they had been selected and the budget for their fees. Following the submission of a Freedom of Information request by the Barnet Bugle it was disclosed the budget for these consultants was "circa" £2 million. In reality this firm has billed Barnet over £8 million in fees. When I challenged the Council's external auditors on this and the fact that councillors had only approved a budget of £2 million I was told that because officers had used the word "circa" it meant no upper limit had been set and any amount of money could be spent without reference back to councillors. That was the day I lost all confidence in the council's auditors to protect the interests of council tax payers. There have been many other examples of waste over the last four years such as spending £27 million replacing perfectly sound street lights with new brighter lights only to spend a further £4 million on a glorified dimmer switch to save electricity. More recently has been the massive spend on the new blue bin recycling system. I am the first person to want greater levels of recycling but the council have achieved higher levels by flinging vast amounts of money at the problem. First of all they spent £3.7 million on new bins and having them delivered (they did get a small rebate due to the problems with delivery). the council then spent £150,000 on adverts about the new bin system and a similar amount on doorstep staff to go round and ask people if they had any questions about the recycling system. The council then bought a new fleet of recycling bin lorries at a cost of £7.3 million. So all up the council spent approximately £11.3 million on the new recycling system. I did discuss this with senior officers at the council who said they had no alternative as they were bringing the recycling contract back in house. I had a different perspective. We had a good recycling system already in place. Kerbside sorting generate high quality recycled material but not enough people were using the system. I would have spent some of the money on a pilot study trying to educate and encourage more residents into recycling - to see how that worked first rather than just splurge money. As it happens recycling rates have gone up but so has the charge made by the North London Waste Authority to sort the waste. In fact it has gone up by over £1 million a year. Then we come on to the waste associated with the entire parking mess. We started with pay & display meters which took cash and which residents wanted. Cllr Coleman decided that the way to go was to pay a company (without a contract) £80,000 to take out 408 working parking meters (a further 43 meters were taken out separately). Two years on and the council spent £200,000 to install 50 new meters capable of taking debit & credit cards. A complete and utter waste. There are many many more examples of waste from a council that is supposed to be on a "relentless drive for efficiency". When candidates come knocking on your door asking for your vote ask them how they will spend your money and what they will do to eliminate financial waste. In 2010 no mention was made about One Barnet or the fact that one company would be running swathes of Barnet Council. What surprises are in store after the election on Thursday. Set out below is a joint letter from the Barnet Bloggers which expresses our concerns. Over the last few years, the activities of the current Conservative administration in Barnet have been closely monitored and reported by a group of bloggers, determined to hold to account the elected members who have so blatantly defied the principle of democratic government, and fundamentally betrayed the best interests of the residents of this borough. We have covered every faltering step of the course followed by the Tory councillors, from their first act, on being re-elected, and lecturing residents and staff on the stark economies necessitated by the demands of austerity, but voting themselves a big fat rise in their own allowances, to the shortly revealed MetPro scandal, which set the tone for the next four years. The MetPro affair involved the use by the Tory council of an illegally operating private security company, which barred residents from a council meeting, secretly filmed local bloggers and activists, had close contact with vulnerable children, and was being rewarded by casual but substantial payments, in the total absence of any contractual agreement. Barnet’s bloggers subsequently revealed that far from being a single case of failure in proper regulation of procurement and contractual management, the council had thousands of legally non-compliant arrangements. Local tax payers’ hard earned cash had been given away in these casual agreements, unquestioned: a real scandal, and on an unimaginably wide scale. The next outrage we reported was perhaps one we should have foreseen: the silencing of dissent at all residents’ meetings, with enforced censorship rules, backed by a deliberate amendment to the local constitution, meaning no member of the public was allowed to criticise, or even refer to anything deemed to be ‘council policy’. The reason for this soon became clear. Barnet was to be privatised, with a massive outsourcing programme, from which an in-house solution was excluded because, we were told, we needed a large amount of capital investment from a commercial partner. There had been no mention of these plans in the 2010 Conservative manifesto. Despite the lack of mandate, the Tory administration pushed these plans through, at the behest of senior management and private consultants. Needless to say, as well as failing to present these plans to residents at the time of election, there was no consultation over the privatisation: a serious breach of regulations, and one criticised in the High Court by Judge Underhill last year. Another policy imposed by Barnet Tories that was brought to account in the High Court was the catastrophic parking policy, which overnight sent the borough’s high streets into fatal decline, and alienated vast sections of the Conservatives’ own natural electoral base. The Barnet Conservative manifesto for the 2014 elections is even more enigmatic than the version they offered voters four years previously. When asked by the Barnet Press why there was no mention of One Barnet leader Richard Cornelius declared that it is a brand that ‘has served its purpose’. Indeed it has, but whose purpose, and for whose benefit? Certainly not the residents and taxpayers of Barnet. Already we have seen the real motives of Capita exposed by their attempts to begin the commercial exploitation of this borough in the form of the development of ‘memorialisation’ of the dead in Hendon Crematorium, and the grossly insensitive removal of benches commemorating loved ones in the grounds, taken away and dumped in a corner of the grounds. It seems an apt metaphor for the exploitation of our borough, by private enterprise, at our expense, sanctioned by our Conservative councillors. And we must ask, if the privatisation of our borough, and the sell off to Capita of our local services has been so successful, why are Barnet Tories not rejoicing in this fact, and sharing their sense of satisfaction with voters? Why are they being so evasive about the real plans that they intend to impose, should they be returned to office this coming week? Is it because the One Barnet brand is now so toxic, it must be dropped, and forgotten, and voters duped into approving another Tory council whose agenda is unstated, but is clearly going to endorse the privatisation of council service and expand this policy wherever possible? We have read this week of plans to privatise child protection services. There can be little doubt that if they are returned to office, without consulting residents, Barnet Tories will be likely to extend the process of privatisation to any other council function they care to delegate. And increased pressure to make massive savings will inevitably lead to cuts in services on a scale as yet unprecedented. There will, of course, be no proposal to deprive themselves of the same level of allowance they still enjoy, despite the limited function they will retain, in a borough where our vital services will be run not for our benefit, with direct control by them, but by a private company, for profit, at our expense. In the accompanying footage below John Dix, blogger Mr Reasonable explains why the takeover by Capita of our council services presents such a threat to the wellbeing of our borough, and what the future will hold for all of us in Barnet, should the Conservative administration be re-elected this week. The choice for voters on May 22nd is clear – vote Conservative, approve the delegation of control of your borough to private enterprise, and the shareholders of Capita – or take a stand, and begin to reclaim your democratic right to control your own destiny. In the run up to the elections on the 22 May I thought I would revisit what was said by the ruling group before the last election in 2010 and see to what extent they have delivered on what they said. As a starting point you could do no better than read an interview with Mike Freer, the "architect" of the entire One Barnet credo as reported in the Guardian. No mention of handing over services to a private company who claim commercial confidentiality. No mention of cuts the most vulnerable. Alternatively you could look at the 2010 Manifesto (see below). No mention of One Barnet or cuts to key services in there either. Given that the track record of the current regime is not to tell you what is coming up after the election what could we expect? Further cuts to services especially for the 10% of residents who are heavily dependent on the council for support; the disabled, the elderly, those with learning difficulties. The council seem to have worked out that it is better to keep the 80-90% of residents content by keeping council tax low and stuff the vulnerable because they have a comparatively small proportion of the vote which is "expendable". When Councillor Cornelius said he thought it was fair to make cuts to Mapledown school there was uproar and the decision was temporarily reversed. However, straight after the election be prepared for a further round of cuts to services. I would also be prepared for a further round of outsourcing. Reading the papers today and the proposal to outsource child protection services, this demonstrates just how much further the zealots are prepared to go in privatising public services - and Barnet are at the forefront of this plan. So when candidates come knocking on your door asking for your votes remember what happened in 2010 and just try and imagine what they have got planned after these elections. In the run up to the elections on the 22 May I thought I would revisit some of the blogs I have posted over the last four years to see of anything has changed. Today I am looking at events in 2011starting with a blog posted in March 2011 and relates to the infamous Council meeting where MetPro first came to the bloggers attention. This became the watershed moment when Barnet's attitude to residents became clear and war was declared on the bloggers. What transpired was that MetPro had no formal contract, were not SIA licensed, had not been CRB checked and had secretly filmed residents at council meetings. However this was at at time when residents were not allowed to film in council meetings, another matter that resulted in a showdown between residents and the Council. Filming of meetings is now commonplace but in 2011 it took a series of heated exchanges and the open filming by bloggers to eventually get the council to relent. 2011 is when the Council changed the rules on residents forums to make it much harder to ask relevant and challenging questions. They introduced this censorship in order to protect the dogmatic One Barnet programme from questions or scrutiny. At they same time they closed down the only scrutiny committee that had responsibility to oversee this project. 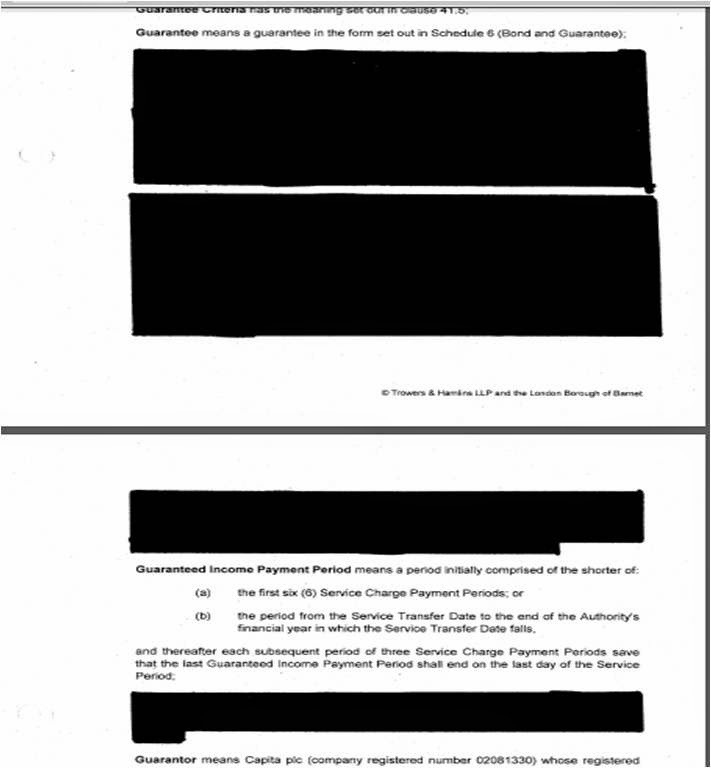 Redaction of any and all information became the norm to the ridiculous extent that the council even redacted details of payments to the Council's recycling partner May Gurney in the "belief" that the payment of £861,000 was going to Mr & Mrs Gurney's daughter May. Roll forward to 2014 and the Council will claim to be more open. In some ways they are having restored the ability to ask any questions you want at residents forums. However, the ability to get an answer which is in any way relevant to the question is a great deal harder and now that One Barnet has been implemented and matters are covered by commercial confidentiality the council can blame someone else for hiding the facts from residents. Take for example the publishing of Capita contract which Barnet said was a landmark decision. Try reading it or downloading it. Still plenty of black ink. When asked about why the Council had given £16.1 million to Capita to fund capital investment when all along we had been told this would be funded by Capita, we got a response but one that very carefully constructed in such a way that it actually told us nothing. So has the culture of secrecy and conflict with the residents changed since 2010? Not really. We can ask questions at residents forums but they have to be submitted two days in advance and you are unlikely to get a straight answer. The amount of time for questions and to address committees has been reduced from 30 minutes plus time for people to address the committee to a total of 30 minutes for everyone. In addition the time allowed to address the committee has been reduced from 5 minutes to just three. How topics as complex as those dealt with at the last Audit committee can be explained in three minutes highlights the way the council stifles meaningful dialogue. I would say that all out war is over but it has now become a cold war, more subtle but no less confrontational with residents. When candidates ask you for their votes ask them how they will be more open with the public and whether they welcome resident involvement in setting council policy. That will be a real test of just how seriously they want resident engagement. Are Student Loans a Monumental Liability? My son has reached the age where he is considering whether or not to go to University. With tuition fees at £9,000 a year for most courses and the cost of student accommodation anywhere between £100 and £200 per week, any decision to go to University needs careful consideration. I know the Government has trumpeted that students loans make it easy for everyone to go to university but I thought I ought to look at what my son would potentially be taking on in terms of financial commitment. Using the Government's Student Loan repayment checker I thought I would check just how much my son would have to repay. Assuming £9,000 per annum tuition fees and £7,675 maintenance loan (to pay for food and accommodation) I had to include the estimated starting salary for my son. The site suggest the average graduate starting salary is £25,000 a year (although experience of my nieces suggests that is wildly optimistic) so that is what I entered. In the final three years of the loan he will be paying back between £9,000 and £10,000 a year in loan repayments. After 30 years there will still be £29,450 of the loan outstanding which at that point will be written off. The problem is that although the repayment in the initial years is low, it is insufficient to cover the interest let alone repay any of the principal. 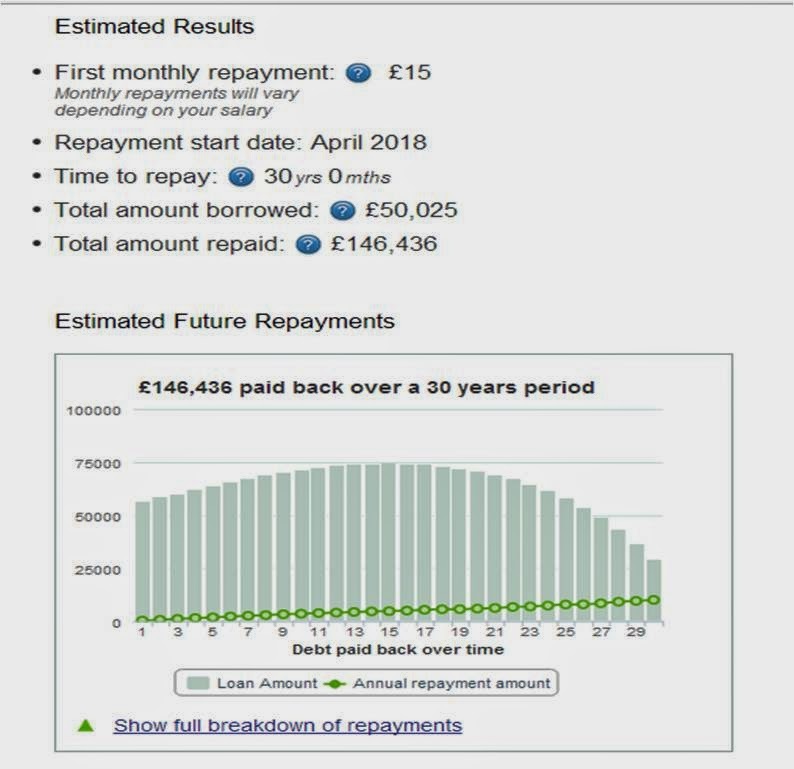 As a result the outstanding loan value continues to increase for the first 15 years by which time the outstanding balance is now £74,350 and repayments are £5,000 a year. Do I think it makes sense for my son to commit himself to paying off almost £150,000 to get a University degree. Definitely not. That will effectively ensure he never has a chance to get on the property ladder. Will we have to forgo holidays, new furniture, car replacement, (and just about everything else) for the next seven years and use all our savings so that we can fund his and my daughter's university places? Possibly. What I resent most of all is the Etonian millionaires in the Cabinet setting up these crazy schemes without thinking through the consequences for ordinary people like me and my family. It will be inevitable that many students will be condemned to a life of renting and debt repayment and that, in my opinion, is wrong. - The Council needs to demonstrate that it has an understanding, at a service level, of the links between costs and performance and achievement of value for money. - As part of the One Barnet programme the Council should develop sound contract monitoring arrangements with third party providers. - The Council should ensure that it is consistent in its approach to evaluating procurement options. - The Council should follow a systematic approach to options appraisals, which includes being specific about benefits/outcomes expected and their measurement. - The Council's Risk Management Strategy should be revised to include tolerance levels to assist officers in making important decisions, particularly around One Barnet. - The Capital Assets Property Management Strategy (CAPS) should be reviewed to emphasise the focus on partnerships that is apparent within the One Barnet programme. - Once the Council has robust fit-for-purpose data for its workforce it should develop a workforce strategy which links in with how One Barnet is to be delivered. - There should be a focus on equipping senior managers with the necessary change management skills to ensure that the One Barnet is successful. So what have the Council learnt over the last four years. Have the Councillors worked hard to improve these matters? Sadly we see so many of the same issues being raised in the last audit committee meeting held just a couple of weeks ago. The report this time was prepared by the Council's Internal Audit team but it suggests that virtually all of the problems found by Grant Thornton in 2010 remain a problem today. "We found an overspend on the Harrow & Barnet Public Law (HBPL) contract, with uncertainty noted in Delivery Units regarding the charging process. Further, it is unclear what income will be achieved on the HBPL contract from the provision of legal services to Re and the Barnet Group and how that will be accounted for"
"There is no requirement for the order of agency staff on the Comensura system to be approved by a more senior officer. There is therefore a risk that agency staff may be appointed without appropriate approval. This may not be in-line with the Council’s scheme of delegation and lead to inappropriate use of the Council’s resources"
"The Parking Project’s business case listed 13 financial and non- financial benefits to be delivered to the Council throughout the five year contract period, which included income generation, service quality and savings targets. We found that controls were not in place to ensure that the future realisation of these planned benefits was monitored and managed, for example roles and responsibilities for benefit management and planned timelines for benefit reporting. The Benefits Realisation Plan produced at the end of the project had not been reviewed since the project handed over to the Clienting team in May 2012. There are currently significant operational issues with the system in that it ‘freezes’ limiting its use for operational staff. This has been reported however calls to the helpdesk regarding issues with Swift have remained unresolved and senior management within the delivery unit have not escalated the matter to ensure its resolution. "There is no corporate business continuity strategy, and this is recognised as a risk on the Council's risk register. Previous business continuity incidents are not formally recorded and there is no lessons learned log." So in four years the council have not really leaned that many lessons and are still getting the basics wrong. What I wonder is why the only people asking these serious questions are the bloggers and concerned residents of Barnet and not the Councillors who we are paying £1 million a year to act as our representatives. There are a few notable exceptions, councillors who do challenge, but they are definitely the exception. The majority of the 63 councillors just sit by impassively and let officers do what they want. That, in my view, is not what makes an effective councillor. I hope you judge carefully the people asking for your vote next week and consider whether they are fit to be running the Council.